When we were asked to review the Joie Pact, I was delighted. 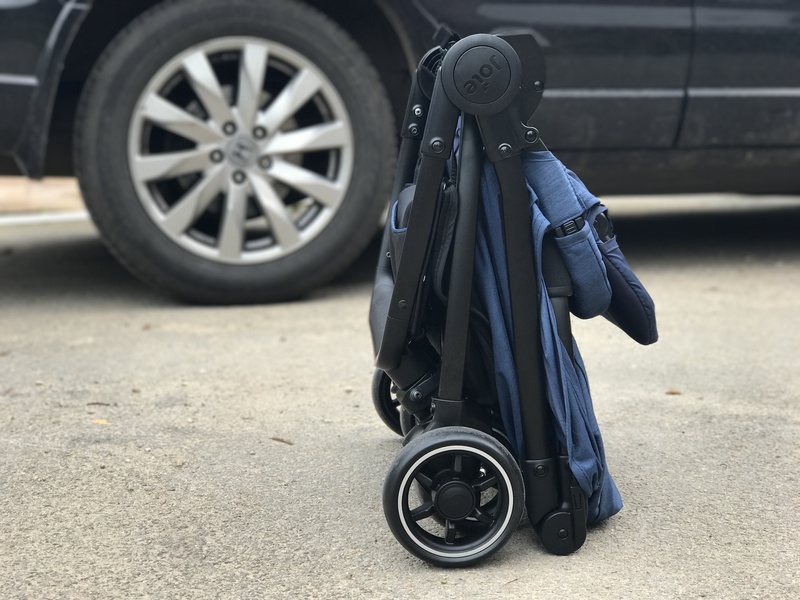 Finally, a buggy that wouldn’t take up half of my boot or break my back every time I attempt to lift it in and out of the car. Don’t get me wrong, my travel system has been great but it’s time to change. I wanted something smaller. Lighter. Simpler. But I didn’t want to compromise on all the things I love about my travel system. Introducing the Joie ‘Pact’. When our Pact arrived, the first thing that hit me was the packaging. It’s bright, engaging and surprisingly small. Expecting to have to perform a mammoth self-build on it, I opened it up warily. Astonishingly, it’s not the case, the Pact is just that tiny when folded. I unpacked the box, clipped the wheels into the buggy frame and just like that we were ready to go. Inside the box was also a bumper bar, rain cover and even adaptors to fit Joie car seats (or others, such as Maxi-Cosi). Suddenly, the Pact became a travel system in it’s own right. Only it was a third of the size and weight of my previous one. Out and about, the Pact performs well. We’ve taken it shopping, to the beach, out around the village lanes and more. 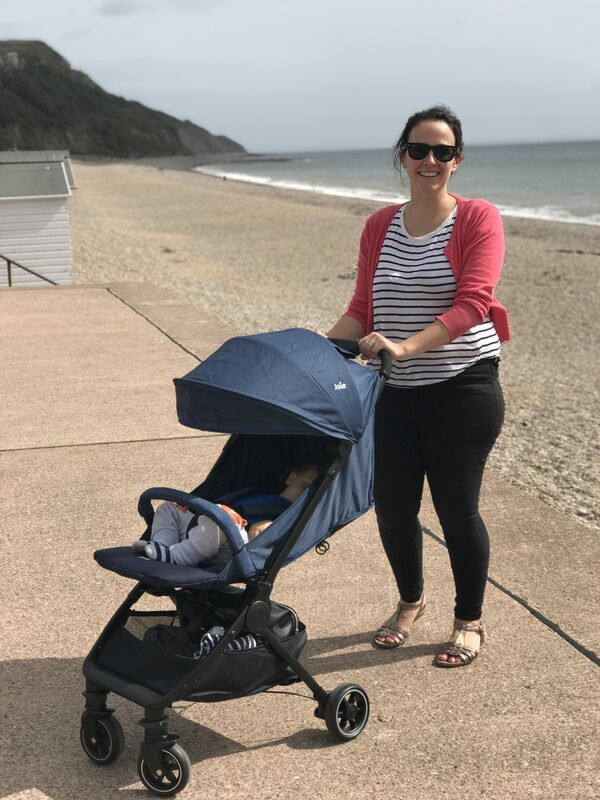 The one hand fold mechanism works brilliantly, allowing me to hold my son in one arm and set the buggy up (or put it down) with the other. It’s quick, intuitive and really effective – leaving you with a small briefcase sized parcel. The design means you end up with a metal handle to lift it by or a fabric strap to allow you to carry it over your shoulder; not something I’ve done much of but would recommend for a holiday. 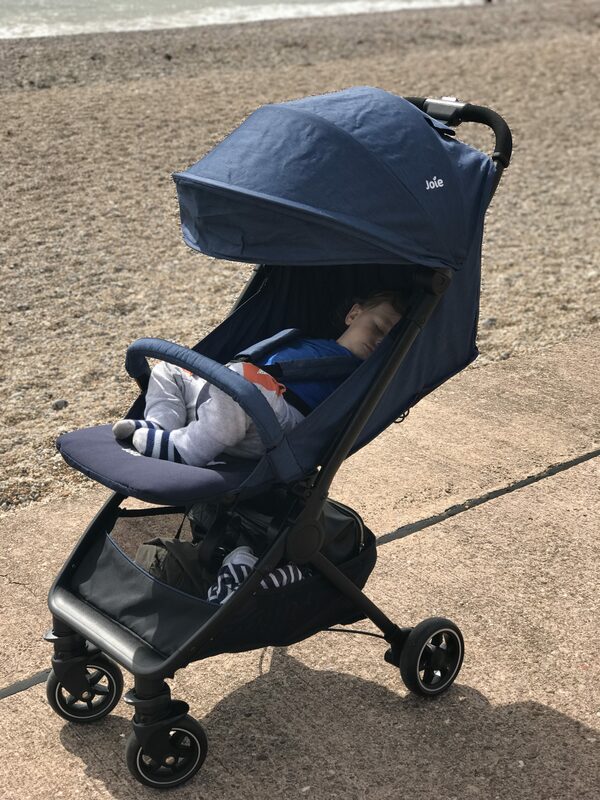 Our son spends one day a week with his grandparents and they’ve been hinting about a lightweight stroller for some time. I’m pleased to be able to tell them I’ve found them just the buggy for stashing in the corner of the boot. The buggy itself is a nice size. My son doesn’t look huge in it, unlike some lightweight, travel buggies. The five point harness is small in design but very effective; the shoulder straps stay in place without him being able to wriggle free… a very important factor for a toddler! The seat reclines fully making it suitable from birth, although we’ve not tried that function. It wouldn’t be a popular move with our son, he wants to see out constantly. This recline function is managed by an adjustable strap allowing you full control of the seat angle. I would say, for us, it doesn’t quite go upright enough. He likes to grip on to the bumper bar and lean forward which can pull the seat forward with him. It’s not a big issue and I imagine a more upright back would require a bulkier design, so in that respect, I’m pleased it’s not. On to the most important consideration, the basket. Let’s face it, basket size can make or break the functionality and usage of any pushchair. The basket on the Joie Pact is surprisingly roomy for a lightweight stroller. We managed to fit my handbag, the change bag, a lunch box and my husband’s jumper in there without it overflowing. It’s a little like a tardis! Not only that but it’s easily accessible, something that’s often overlooked. Now, let’s talk holidays. The Pact is billed as a holiday essential; it even comes complete with a travel bag to zip it into for air travel. 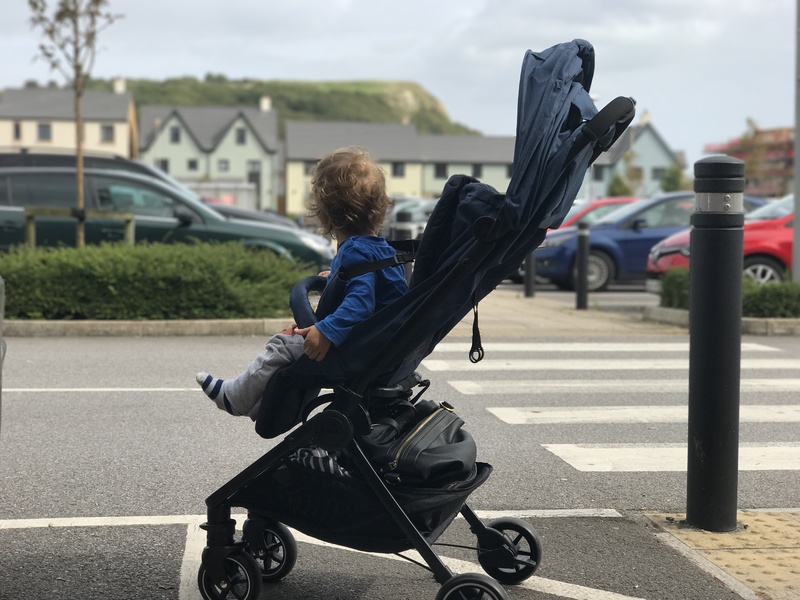 It’s weight and size means it rivals some of the top billed travel buggies at a fraction of the price. For me, the sun canopy makes it a must. It’s huge, giving great coverage for your little one and even pulls down further to give an ‘eyeshade visor’. No more trying to badly position a wobbly parasol. As someone who spent an entire holiday covering their child in factor 50 sun cream, I wish I’d had it then. Especially as it’s UPF 50+ itself. Since we’ve had the Pact, we’ve not even looked at our other pushchair, even in the rain. Yes, at times, it feels a little too lightweight, if that’s possible. It’s not until you start to use it that you realise just how good it is. In all honesty, I’m a little amazed by it. It’s quickly become a firm favourite in our household, garnering praise from all manner of family members. As my (rather buggy bored) husband put it, just the other day, ‘it really is quite good, isn’t it?’. I couldn’t agree more!